The government's enthusiasm for park-making has outstripped the capacity of existing provincial legislation and management systems to meet the myriad demands placed upon them. By many standards, British Columbia has one of the most progressive and ambitious protected areas systems in the world. 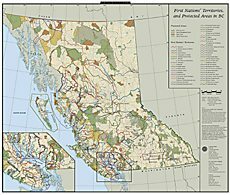 In 1991, the BC government made a commitment to protect 12 percent of the province's landbase by the year 2000. Yet important questions about the protection of natural areas remain. The current approach of separating out ecological, cultural, and recreational values in protected areas belies a growing recognition of their intersection. In the view of First Nations, whose cultural survival is intimately tied to the health of their territories, people are indeed an integral part of the environment. To address these issues, Ecotrust Canada and Ecotrust published More Than the Sum of Our Parks: People, Places and a Protected Areas System for British Columbia in December 1997. Included is a Protected Areas Act, a five page proposal that frames how such an Act might be drafted. Continue to strive for an expanded protected areas system that conserves ecosystem integrity and bases the percentage of the landbase that is protected on scientific criteria. Apply protected areas legislation to designated crown lands that are adjacent to a protected area and critical to maintaining connectivity and ecological integrity. Establish government-to-government relationships with First Nations and use those ties to facilitate the development of joint management agreements and successful examples of joint stewardship on the ground. Enacting legislation to clarify that ecological integrity, not recreation, is the top goal of protected areas. Expand the list of prohibited activities to cover mining, hydroelectric development, oil and gas development, logging and high-impact tourism. Devise creative ways to encourage the stewardship of BC's protected areas system.